DETROIT -- Ford Motor said European earnings slid 66 percent in the fourth quarter as higher warranty and commodities costs and the effects of Brexit took a toll. Quarterly pretax profit in the region fell to $56 million and for the year tumbled 81 percent to $234 million from record levels in 2016. The European results were a drag on the U.S. parent company, which saw quarterly adjusted pretax profits drop 19 percent to $1.7 billion. The automaker cited higher steel and aluminum prices, as well as adverse currency rates. "It was a very challenging year, but also a year of progress," CFO Bob Shanks told reporters. "It's very, very clear we have to improve the fitness of the business." Ford's fourth-quarter operating margin was 3.7 percent, down 2 percentage points from a year earlier. Ford's global net income for the quarter swung to a gain of $2.4 billion from a year-earlier loss of $800 million, reflecting a lower effective tax rate and pension re-measurement. The year-earlier loss had been due mainly to accounting changes. Revenue rose 6.7 percent to $41.3 billion. For the full year, Ford's 2017 pretax profits fell 19 percent to $8.4 billion, slicing its operating profit margin to 5.0 percent from 6.7 percent in 2016. Net income was up 65 percent to $7.6 billion, as revenue rose 3.3 percent to $156.8 billion. Ford's quarterly earnings were driven by North America, where pretax profits fell 16 percent to $1.6 billion in the fourth quarter, in part because of expenses related to the launch of the Ford Expedition and Lincoln Navigator. Revenue in North America rose 4.3 percent to $24.1 billion. For the full year, pretax profits fell 16 percent to $7.5 billion in North America, even as revenue edged up 1 percent to $93.5 billion. In South America, Ford's pretax loss narrowed to $197 million in the fourth quarter, from a loss of $293 million a year earlier. For 2017, its pretax loss in the region narrowed to $784 million, from a loss of $1.11 billion in 2016. In the Middle East and Africa, pretax losses narrowed slightly to $70 million in the fourth quarter from $71 million a year earlier, and to $263 million for the full year from $299 million a year earlier. 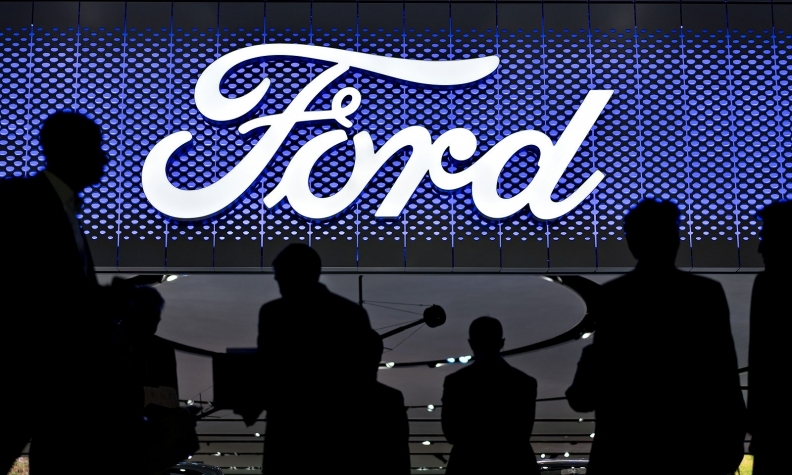 Pretax profits at Ford's Asia Pacific business unit collapsed 98 percent, to $5 million in the fourth quarter from $284 million a year earlier, largely due to a sales drop in China. For the full year, pretax profits there slipped 11 percent to $561 million. Ford Motor Credit Corp.'s fourth-quarter pretax profit jumped 53 percent to $610 million, and its full-year pretax earnings rose 21 percent to $2.3 billion.